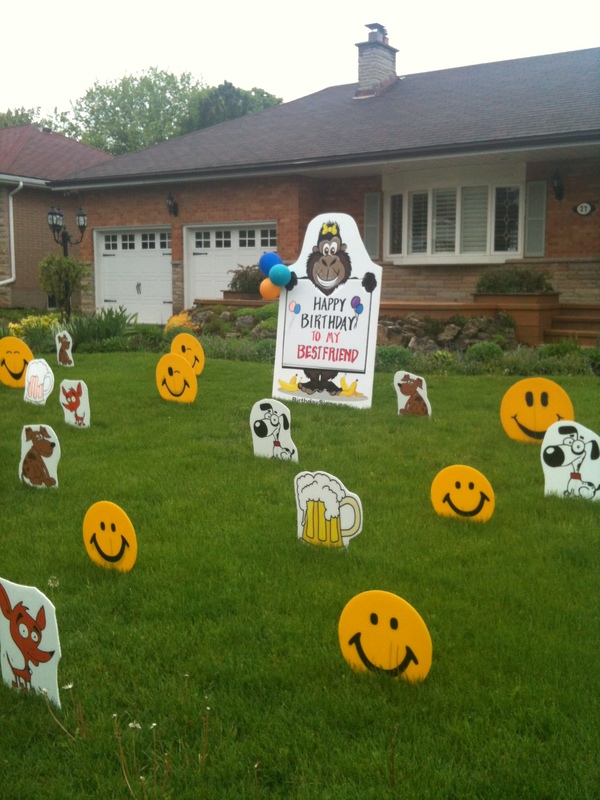 Birthday lawn ornaments are small signs either in full bodied plastic or flat plastic signs. The flat lawn ornaments are designed by our own in house graphic artist. After our designs are complete , printed and cut we fit them with metal posts ready to be placed around the character sign. These birthday lawn ornaments draw the attention of people that pass by . Have a look below at some of our custom lawn ornaments. This is sure to attract many passers by to maybe unite with a loud honk on their vehicle horn. This is truly a blast for any celebration. Have a look as we add new birthday lawn ornaments on a regular basis. Feel free to to mix and match for your lawn rental. If you are ready to order click here. We offer 3 dimensional and 2 dimensional lawn ornaments. Birthday lawn ornaments are included with our large character sign displays. You are also welcome to mix and match your ornaments. Order Online Today. Birthday lawn ornaments . Pink flamingos , cows , pigs , pink elephants , golf balls , soccer balls , hearts , penguins , hearts , lips , frogs ,dogs , beer mugs , mad birds .